Her NG drainage tube is clamped off, and if she tolerates that they will give her a test feed of a teaspoon of oral electrolyte solution to see how she does. 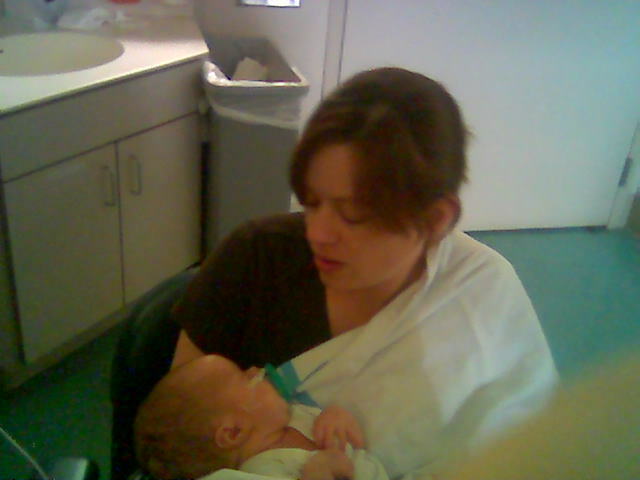 Her mom so loves to hold her, and it is so hard with all the tubes and wires that she still needs. But where there is a will, there is a way. Jess and Emma are sooooo beautiful together. I love seeing the pictures. Thank you for keeping us up to speed on her progress. So proud of you so quickly after such a hard delivery. Love to you and Emma from California! This page contains a single entry by alicia published on July 3, 2007 9:20 PM. picture day for emma was the previous entry in this blog. 2 weeks old today is the next entry in this blog.